Here's a quick golf history quiz for you. When was the last time a golf tournament was decided by the clock? Well, we have taken a poll of our entire staff and the answer here is “NEVER.” But yesterday's finale to the Bridgestone Championship supporting rubber manufacturers around the world may be a first. Tiger and Paddy were dueling it out in an epic battle with ball and club. Tiger begins the round three shots behind but shoots 30 on the front nine to Paddy's even par 35 and takes a two shot lead. Then Tiger stumbles a bit on holes 13-15 with a couple of bogeys while Paddy makes two pars and a birdie. The lead has changed again. Paddy is looking the Tiger right in the eye. Then as they get to the monstrous par-5 16th. A rules official informs them they are on the clock. Bingo, instantly the mood has changed. In a matter of seconds PGA European Tour rules official John Paramor has single handedly squelched one of the best duels of the year. You know the rest of the story. Both men hurry up and hit their tee shots – Tiger way left, Paddy way right. In order to speed up Tiger next plays out of turn and hacks it down the fairway. Paddy follows with a horrible recovery and, still trying to play quickly whacks and slaps to a triple bogey eight. Meanwhile , Tiger hits one miraculous 8-iron from 180 yards to about four inches and makes birdie. That's it, end of tournament. Thank you Mr. Paramor. You can read a couple of pieces from from Doug Ferguson here or Steve Elling here. Consider this: Being a rules official in any sporting event involves precise judgment, an uncompromising attitude and a certain amount of stubborn egotism. Paramor has managed to embody the second and third characteristics. It is the first that finds him lacking. The PGA Tour lost control of slow play a long time ago. Accord to Ferguson, Dillard Pruitt was the last player penalized for slow play. That was 1982! The PGA Tour has already infected the game to the point that the patient is now dying of the disease. Countless golf organizations have done research on the cure, but to no avail. This slow play cancer is contagious and its spreading. It will kill the game. 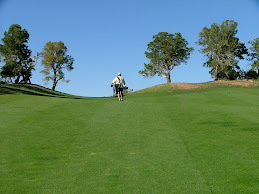 As for the PGA Tour and Mr. Paramor it does not make any difference how fast or slow someone plays. Everyone now knows that golf is a slow game. The best way now to attract new players to the game is through heroic battles of two titans – like the one that got through fifteen holes at Firestone.